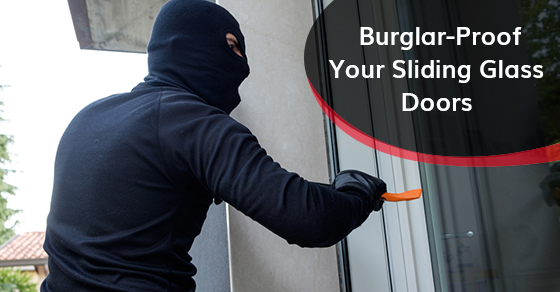 7 Tips To Secure Sliding Glass Doors | Calgary Alarm Inc. Sliding glass doors are a great addition to your patio. With their unique construction, featuring large areas of glass and gliding tracks, homeowners can enjoy plenty of natural light and regulated ventilation. However, you will need to consult a security alarm company to keep your home safe. Burglars love sliding glass doors too. The large glass surface area makes it easy for them to spot valuables in your home before breaking in. The locks are usually weak and easy to “pick.” And if need be, the burglar can break the glass to intrude your home. Reports also suggest that many people forget to lock their sliding glass doors. If you include the fact that these doors are positioned in the backyard where there is minimal risk of intruders being spotted by neighbours or passersby, it is clear that homeowners should employ more stringent security measures to protect their families and possessions. Here are a few tips to secure sliding glass doors. Security bars—These are durable metal poles that are fixed to the doorway and then extended to the gliding door to keep it in place. Simply fold the bar when you want to open the door. Double bolt locks—These locks are comprised of two pieces: one piece is fixed to the door frame, while the other one is fixed to the sliding door. When the door shuts, the piece on the frame is seated inside the one on the door. The piece on the frame has an allowance where you can insert a metal bolt to secure the door. Door sensors—These will trigger the alarm when the door is opened, and possibly scare off burglars. Install glass-break detectors—These will trigger your home security alarm when the glass on your sliding door is broken. Installing impact-resistant glass—You can consider replacing your existing door with impact-resistant sliding doors that offer a lot more resistance to breaking. However, they are heavy and costly. Installing a security window layer—When applied to glass, this protective sheet makes it more resistant to breakage. Even with a home security system, your sliding glass doors can still be a point of intrusion if poorly maintained tracks and rollers prevent the door from closing and functioning properly. Clean the tracks regularly and adjust the rollers as need be to stop thieves from simply lifting the door to gain entry into your home.